What are data prefixes and suffixes? Target Dashboard has a number of other dashboard items (such as scorecards, gauges, and more) that don&apos;t ordinarily use currency prefixes (unless you select the data type as currency), or percentage suffixes (again unless you select the data type as percentage). When you use calculated columns, there could be times when you&apos;d like scorecards to specify the currency symbol or the percent symbol, to help clarify exactly what&apos;s being presented. These times are why we&apos;ve added user specified prefixes and suffixes - to help your dashboards be instantly understood! Step 1: Create some type of &apos;other&apos; dashboard item using your data, then click on My Data. 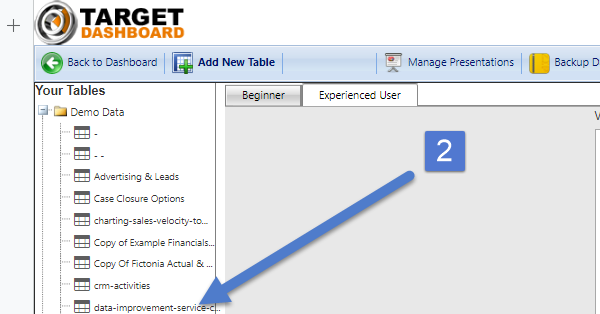 Step 2: Select the data table you used above. Step 3: Click on Design, so that you can edit that data table. Step 4: Click on the specific item you&apos;ll be editing. Then repeat this step for each other item as needed. Step 5 & 6: Add a prefix and/or suffix, such as prefixing with £ or suffixing with %, or other symbols. Step 6 & 7: Insert your chosen values as prefixes and/or suffixes and click save.